We all have to deal with paper. Not everything comes into the email inbox, so we work out workflows of how to deal with all that paper… moving from envelope tray to inbox, to work-in-progress, to completed and for file. However there is the new way of dealing with this that many larger/medium size companies have been using for several years using relatively expensive hardware/software combinations for scanning on entry and then using expensive groupware/workflow software to move around to required processor. Now however this can be done cheaply and on a budget with the right process. How complex you make it depends on scale, as the single person operation can get away with a looser workflow than the 20+ person operation. The most important piece is getting the paperwork scanned into the machine and this can now be done using a simple all-in-one printer/scanner or standalone scanner available for less than £50. 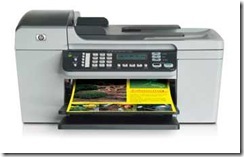 HP (and I am sure many others) offer the F4272 Printer/Scanner/Copierwhich comes with their own Solution Center software which can be simply configured to scan multi-page documents into PDF/Searchable PDF files, for less than £40. This is a quick and effective solution for the very small office, or you can go up a gear and obtain a device with an autosheet feeder such as the HP Officejet 5610 Printer/Scanner/Copier/Fax for £54. Once you have the document in PDF form, then the whole document handling and filing process becomes oh so much simpler. After the hardware/software solution, all that is really required is the central document storage location and/or email distribution tied to a simple filing system (how about Year Folder/Month Folder) and a fixed file naming convention (such as YYYY-MM-DD Subject Matter.pdf). I have found this a very effective method of dealing with incoming paperwork for many years, although I have not had the benefit of the low cost of entry that today we have. So what is the mobile aspect of this? Having access to all of your company documents online in PDF form from wherever you happen to be, and with the use of the modern USB powered Scanner such as those from Canon, you can make use of the same ingest process ending up with PDF files of all your documents wherever you are, as those scanners are really small and light.